The main difference between UEFI and legacy boot is that the UEFI is the latest method of booting a computer that is designed to replace BIOS while the legacy boot is the process of booting the computer using BIOS firmware. UEFI is a new booting method that addresses the limitations of BIOS. It is managed by a group of chipset, hardware, system, firmware and OS vendors called UEFI Forum. Legacy boot is the regular method of booting the system using BIOS. In brief, UEFI provides additional security features and fast processing on the computer. It offers a secure boot that can avoid loading boot time viruses. UEFI stands for Unified Extensible Firmware Interface. Most new motherboards consist of this new type. It has more advantages than using BIOS. Most importantly, it provides a user-friendly Graphical User Interface (GUI). BIOS provides a blue color screen with various options. The normal BIOS cannot recognize large storage drives. UEFI provides a good alternative to this issue and recognizes large storage drives. In regular BIOS that uses the keyboard to select the options, UEFI allows controlling the interface using the mouse. Moreover, UEFI contains a secure boot. It avoids any digitally unsigned drivers from loading and helps to prevent any malicious software. 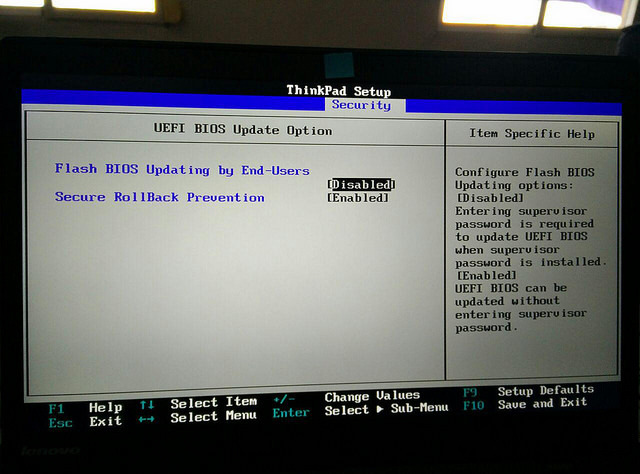 Some computers with UEFI allows the user to enable legacy BIOS compatibility mode. UEFI boot uses the UEFI firmware. It maintains a list of valid boot volumes called EFI service partitions. During Power On Self-Test (POST), which checks whether all hardware is functioning properly, the UEFI firmware scans all the bootable storage devices that are connected to the system for a valid GUID Partition Table (GPT). The firmware itself checks the GPT to find an EFI partition to boot from. Legacy Boot is the boot process used by BIOS firmware. It stores a list of installed storage devices that are bootable such as Floppy Disk Drives, Hard Disk Drives, Optical Disk Drives, etc. according to a configurable order of priority. When power on the computer, the BIOS performs Power On Self-Test (POST). Then the internal speaker makes a short single beep to indicate that the booting up is normal. The beep code helps to identify the code and to act on further troubleshooting. After completing POST procedure, the firmware loads the first sector of each of the storage target into memory. Then, it scans it for a valid Master Boot Record (MBR). If a valid MBR is found, the firmware passes execution to the bootloader to select a partition to boot from. If one is not found, it proceeds to the next device in the boot order. UEFI is a booting process in modern computers that provides advanced capabilities than BIOS. Legacy Boot is the process of booting the computer using the BIOS firmware. This explains the basic difference between UEFI and legacy boot. Moreover, UEFI uses URFI firmware that maintains a list of valid boot volumes known as EFI Service Partitions for the boot process. Legacy boot uses the BIOS firmware for the boot process. Another important difference between UEFI and legacy boot is that UEFI has additional security features and is more efficient than legacy boot. Also, UEFI is more user-friendly than legacy Boot. While UEFI uses the GUID Partition Table (GPT), BIOS uses the Master Boot Record (MBR) partitioning scheme. 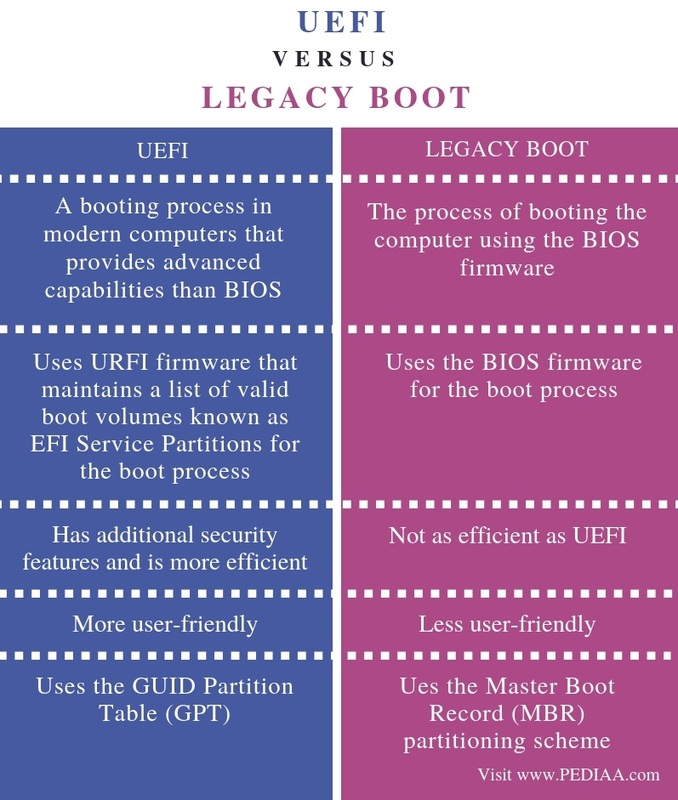 The difference between UEFI and legacy boot is that UEFI is the latest method of booting a computer that is designed to replace BIOS while legacy boot is the process of booting the computer using BIOS firmware. In brief, UEFI is the successor to BIOS. 1. “What Is Unified Extensible Firmware Interface (UEFI)? – Definition from WhatIs.com.” WhatIs.com, Available here. 2. “BIOS.” Wikipedia, Wikimedia Foundation, 9 Sept. 2018, Available here.